Auto-aiming at a jewelry show attendant as he drops money on the counter in GTA Vice City. Store robbery is a feature in the Grand Theft Auto series which involves the theft of money from selected stores or businesses in a city. Robbery of businesses have been a staple element of specific missions the series since the first game, but the ability to rob a business at any moment of the game was only introduced in Grand Theft Auto: Vice City and resurfaces in Grand Theft Auto: Vice City Stories and Grand Theft Auto IV. 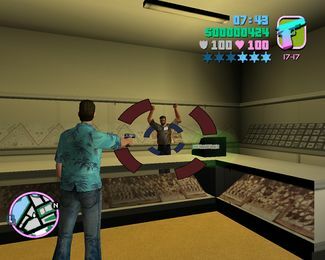 Store robberies were first implemented in GTA Vice City as a side activity that can be executed at any point of the game by entering specific stores in Vice City, and threatening their store attendants at gunpoint, by either aiming them with the aid of an auto-aim in the PC version with "Classic Control" or the console versions, or by pointing the crosshair at the attendant while using "Standard Control" in the PC version. The longer the player aims their weapon at the store attendant, the more money is dropped on the counter for the player to pick up. However, for each drop, the player's wanted level is raised by one star, capping at a 3-star level; the amount of money the player may receive ranges from a low of less than $100 to a maximum of several thousand dollars, rewarding the player increasingly at the expense of being confronted by more aggressive law enforcement. Café Robina in Little Havana. Coffee Bagels Donuts, across the street from the Little Havana VCPD. Dispensary + in Downtown, just east from Rock City. Downtown jeweler, across the road from the Downtown Well Stacked Pizza. In GTA Vice City Stories, the game's rendition of Vice City introduces a myriad of new businesses with interiors that can be entered and robbed. However, the mechanics of store robberies is modified, and as a result no longer requires the player aim their weapon at the store attendant. Instead, the player may simply kill the attendant, or force the attendant to hand over their cash onto the counter by destroying anything of value within the store (i.e. supermarket refrigerators, clothing racks, or electronics items) using any weapon. The returns from basic store robberies are often very low (at least $100), and store attendants may refuse to pay up even if the player destroys store property (which may prompt the player to simply kill the attendant anyway for money). While stores at the Vice Point Mall feature interiors and store attendants, none of them can be robbed in a similar manner. Store robberies in the game is integrated into Empire Building's Protection Racket, which offers higher financial returns. The player having just robbed $22 from a laundromat's cash register in GTA IV. Store robbery in GTA IV is significantly simplified. 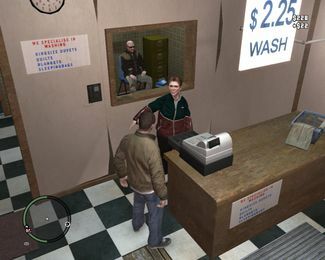 Players no longer require to threaten or kill a storeowner, but simply walk up to their counter's cash register and open the tray to obtain their cash; as a repercussion, the player may either receive a one-star wanted level 10 seconds after the robbery, or an instant one-star wanted level in the case of Modo as the store has an alarm that immediately goes off the moment the player steals from the cash register. Often times, the amount stolen may only range from a high of a couple hundred dollars to a low of nothing at all, making the business of robbing stores far less lucrative. The Korean store damaged during "Bull in a China Shop", but only accessible through glitch or modifications. This page was last modified on 25 September 2012, at 23:58.